I've finished "The Dopaminergic Mind" - another that is HIGHLY recommended because it is not too long, is explained simply, has fascinating data that you are unlikely to find assembled together as it is here, or even to find it easily. Now, if this guy had only read Wolpoff and Gribbin, I bet he would have refined his theory somewhat. Nevertheless, his discussion of what dopamine does in the brain and how it is associated with both culture building and culture destruction is great! The book is excellent, chock-full of fascinating insights into the function of dopamine in shaping evolution, our minds, our societies, and cultures. It's extremely detailed (I will give a general overview here) but still easy to read. [T]he very hemispheres of the brain are adapted, right/left to the environmental or experiential permanence of chaos/order or unexplored/explored territory, with consciousness serving the Logos role of communicative explorer (a function related in one of its deepest manifestations to the function of the hypothalamically grounded dopaminergic systems). At this point Previc introduces the idea of two distinct dopaminergic personalities - those more serious minded and those more creative/impulsive. Damage to the lateral/nigrostriatal system, which is deeply aligned with the prefrontal cortex, produces major damage to cognitive abilities. However, damage to the ventromedial system produces more OCD and substance abuse disorders, where there are dysfunctional motivational/reward/inhibition mechanisms. Hyper or hypodopaminergic personalities thus manifest disturbances in either of these two ways. Dopamine also inhibits seretonin, with leading to hyperdopaminergic personalities having 'cold' and 'distant' personality features. upward movements more than downward ones. Those last few points are particularly interesting. To explain why dopamine is associated more with ballistic eye movements, as well as movements into upward and outward space, he explains the four brain systems which we use to operate in 3D space. The first is peripersonal - biased towards the lower visual field and near the body. The second is the ambient extrapersonal, which is involved in controlling our posture and movement, but also biased toward the lower field. Both are primarily concerned with near-person space. The last two - focal extrapersonal and action extrapersonal, are oriented towards distance. The former is involved in search and scan of the environment, while the latter aids in navigation of and orientation towards stimuli in the environment. 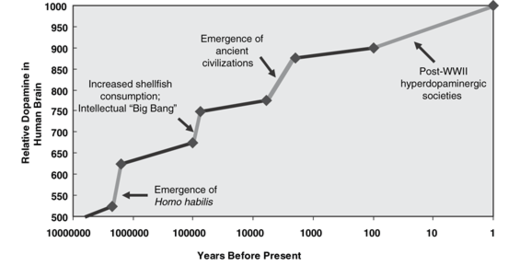 major increases in the adaptive value of dopaminergic traits such as achievement,conquest,aggression, and masculinity beginning with late-Neolithic societies. The dark side of increased dopamine: An increase in disorders involving dopamine dysfunction, including ADHD, workaholism, autism, Huntington's disease, Mania, OCD, Parkinson's disease, Phenylkentonuria, schizophrenia, and Tourette's syndrome. Relinquishing the dopaminergic imperative will lead to a post-dopaminergic consciousness in which the key traits of the dopaminergic mind (e.g. far-sightedness, restlessness, detachment, exploitiveness, intense motivation for secondary goals such as wealth or abstract ideas) will be balanced or even replaced by their opposites. It will not be easy for us to transition to a value system that predominated before the dopaminergic imperative reigned supreme,even as we attempt to retain much of our modern economic and technological infrastructure. However, the key message of this book is that the dopaminergic imperative can indeed be relinquished because it is not primarily part of our genetic inheritance. Just as our dopaminergic minds were forged by ecological forces and pressures such as thermal adaptation, diet, and exercise and later by the societal adoption of the dopaminergic imperative, so, too, can our minds be returned to a healthier balance over successive generations by altering our ideals and societies. Liberals may owe their political outlook partly to their genetic make-up, according to new research from the University of California, San Diego, and Harvard University. Ideology is affected not just by social factors, but also by a dopamine receptor gene called DRD4. The study’s authors say this is the first research to identify a specific gene that predisposes people to certain political views. While we know that it's impossible to say a gene 'causes' this or that, it would be interesting if further research revealed what role this gene was playing, especially given the powerful role dopamine plays in the construction of our character. A very thought-provoking book into how powerful one neurotransmitter, and its effects, can drastically shape the course of history. Great presentation of this furiously interesting book. A fascinating follow-up is Damasio's "The Strange Order of Things: Life, Feeling, and the Making of Cultures". Would it be more useful to read Damasio's book reading Previc's? Or is Previc's book sufficient on its own? Here is a link to amazon. The book is a bit more pricey, but the kindle version is the cheapest of all. Anyway it is also on my reading list and thank you for the summary Hesper. I don't know about the order because I have only now started The Dopaminergic Mind, but I think that either way, Damasio's The Strange Order of Things: Life, Feeling, and the Making of Cultures is a must read, and you may miss out on something if you skip it. It can really add important information to the way you view emotions, drives, evolution and societies in general. I read it about a month ago, and it made quite an impression, FWIW. I'll try to post some quotes asap. And great synopsis, Hesper, thanks! The two books address different aspects of emotions and how humans got to be the way they are. REALLY important information about our machines. And, as we know, without comprehensive knowledge of the machine, we can't really know who or what we are. Great summary on "The Dopaminergic Mind", Hesper, thank you! I look forward to reading both books. Thanks Hesper for the informative and concise summary. It's very interesting stuff. Thank you Chu! Both books sound really interesting. The bolded part reads like I'll definitely enjoy the book! Thank you Laura, you definitely sold it to me! If there is no difference in terms of the order of reading then I'll start with the cheaper one - 3 months of NO rental have been rather unkind to my finances. As Gawan pointed out, The Dopaminergic Mind is a bit pricey but Amazon books sometimes go down in price so I may get lucky by the time I've read Damasio. I think that maybe the Dopaminergic Mind is pricey because that's what the system does to books that are really loaded with crucial info. At least it has always turned out to be that way when I've been driven to buy one that was more expensive than I would have liked to pay. This is definitely true about Detmer's Challenging Postmodernism. Last time I checked a print version was around £50 and up so I settled for a Kindle edition which cost £15. Brownstein's Iodine book was also expensive (£30-40) when I wanted to buy it and it did go down in price. I ended up getting it for £15. So I do keep my eyes open for a deal. Apparently kindle versions are not owned by the user, just borrowed, so it would be safer to have a hard copy. I don't trust Amazon's Kindle after they removed a copy of 1984 from users' Kindles behind their back. Out of all books, of the irony! I've noticed that too. However, in this instance, it might also have to do with the fact that it is published by Cambridge University Press, whose books, like those published by another academic publisher, Brill, are generally pricey. They don't expect to sell many copies. I recommend checking nearby libraries. University libraries tend to buy books by these two publishers right when they are published. Thanks for the recommendation by the way! I can tell ya, that after reading Damasio and Previc, you will NEVER look at yourself and your thoughts/emotions the same way again. I went ahead and bought them both. I'm not the fastest reader so I won't be able to contribute to this thread very soon but I'm looking forward to reading what others share! I guess this may play a part I don't think this is a general rule. Detmer's Challenging Postmodernism wasn't published by CUP but by Humanity Books and the printed version of it is very expensive. Not to mention that second hand copies should not be this exorbitantly priced as publishers don't make money out of them anymore. Even if there is a sudden increase in demand for a specific title that drives the prices up I guess the publisher would see an opportunity to make money and print more copies. Also, I don't know how big the Red Pill Press is but I'd risk a guess that they're smaller than CUP - and yet their books are reasonably priced. Thanks for the summary. I was wondering if I should get this overpriced book, because I have a dopamine problem. There are some print on demand copies available at abebooks.com for $45-$50 USD. I actually had some unopened L-Tyrosine that I avoided taking because I was taking something else to see if it helped with seeking behavior. So I've taken a few for the past few days. I still take 5-HTP and GABA, and notice a difference when taking them. But the serotonin inhibition part is interesting. And I can relate to the cold and distant personality features too.